Regardless of industry, it has become a frequent occurrence that behind every data-driven marketer is an analytical ninja. Together, they formulate recipes in addressing the customer-centric paradigm that considers the different actions that a brand can take for a specific individual, and decides on the “best” one. The goal of next best action analysis is to produce an offer, proposition or service determined by the customer’s interests, and the organization’s objectives and policies. Inbound real-time interactions, like websites, mobile apps or call centers. Outbound scheduled or triggered interactions, like email, direct mail or SMS. Before diving into the nuts and bolts of developing an analytical approach to support this, let’s take a moment to consider the value proposition of micro-moment marketing. Do marketers need to adapt to capture the attention of consumers? It's important to objectively realize that your brand or product isn't the center of your consumer's world. In fact, most marketing-centric content is perceived as an interruption to a customer-oriented experience. The key of micro-moment marketing is to embrace the notion that a few seconds exist to capture the attention of your target. Within that tiny window, brands are challenged to convey a communication that resonates. Ultimately, the customer journey is just an amalgamation of micro-moments across channels, devices, and varying flavors of intent. Sometimes these moments will be focused on content consumption, raising awareness or seeking service, while other interactions are more purchase-driven. Aligned with key business imperatives. Next-best-action strategies are evolving, and the topic of predictive analytics, machine learning, and artificial intelligence is the headline. At the center of the conversation is the desire to embed analytics with rule-based constraints into customer experiences to provide the optimal treatment, one step, or decision, at a time. Brands desire integrating propensity scores to improve arbitration processes for offer propositions during real-time interactions, or when triggering communications. Every marketing analytic problem requires three key considerations. Data (what information can we leverage?). Discovery (which algorithm can help us make better decisions?). Deployment (how will we take action?). 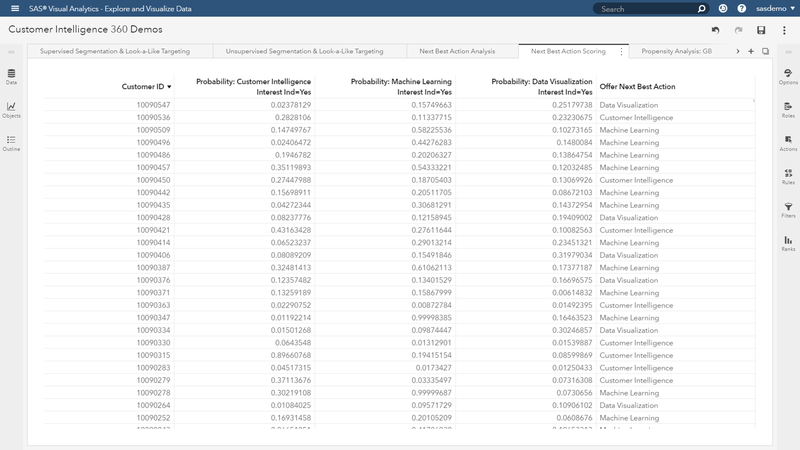 I recently wrote about how users of SAS Customer Intelligence 360 can perform end-to-end propensity modeling. For readers seeking a primer, please check it out. Next best action strategies are an applied use case for marketers to leverage predictive propensity scores. 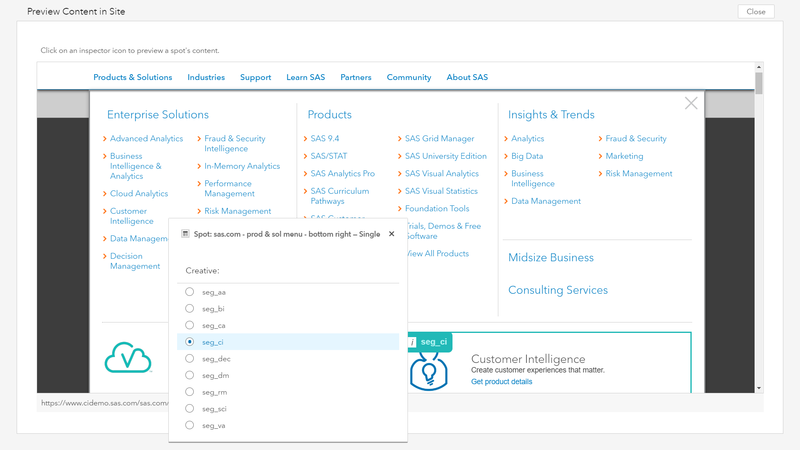 Let’s walk through a product-focused sales example from sas.com. 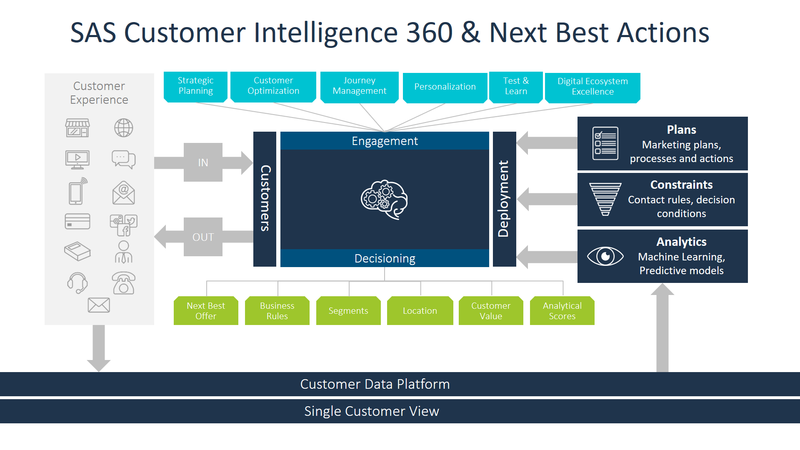 Is the customer (or visitor) more interested in customer intelligence, machine learning, data visualization, cloud analytics, data management, etc.? Now imagine your organization’s product or service offerings as opposed to SAS. The following example is based on personalizing the lower right spot of this menu screen for next best action targeting. The rationale is to use algorithmic propensity scores as part of a broader set of targeting criteria to include (or exclude) customers and visitors in receiving specific creative assets during their digital experience. The intent is to serve what is relevant within opportunistic micro-moments using all available data. 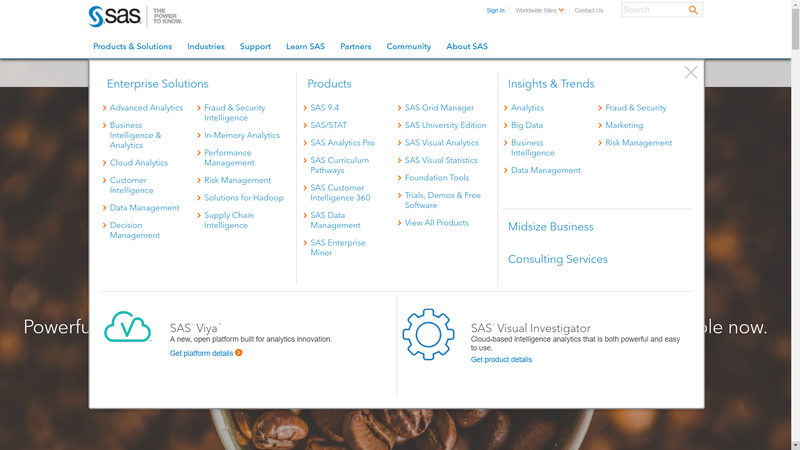 SAS enables users to analyze online and offline data interactively across data visualization, predictive analytics, and machine learning. For this example, I would like to build a group-by regression using the logistic action within SAS Viya for seven potential offers. 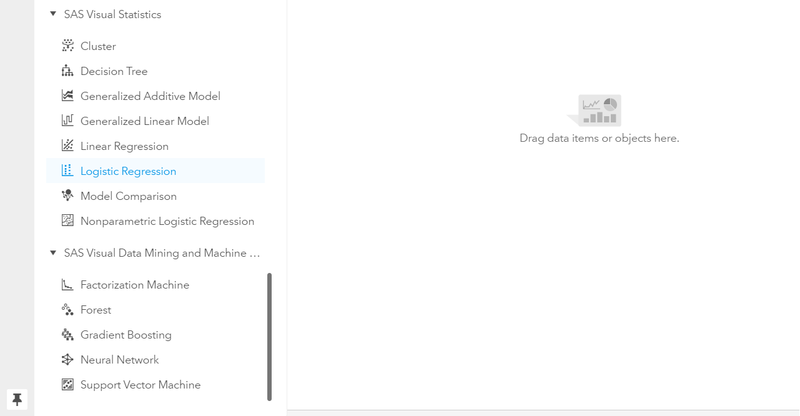 Users select the logistic regression object, drop it into the work space, assign attributes to roles and the model executes to provide results. As opposed to requiring an analyst to build seven unique models to determine which product offer has the highest probability of being relevant, users can leverage the group-by role to complete this task in one step. The result is a unique regression model for the marketable population across every potential product offer. Users seeking to review the statistical assessments of each model can interact with the visualization, and dive deep. For those of you who are more visually driven, enlarging the fit summary plot exposes important insights. The heat map explains which predictors are important, and which are simply noise, for each next best action model. Simply clicking one of the offer models opens more information to access important diagnostics in evaluating the quality of the analysis. It’s important to realize all models are not the same, and have a direct correlation to your marketing key performance indicators. Here is an introductory video of building logistic regression group-by models in SAS. For advanced users who appreciate machine learning techniques, check out this demo. 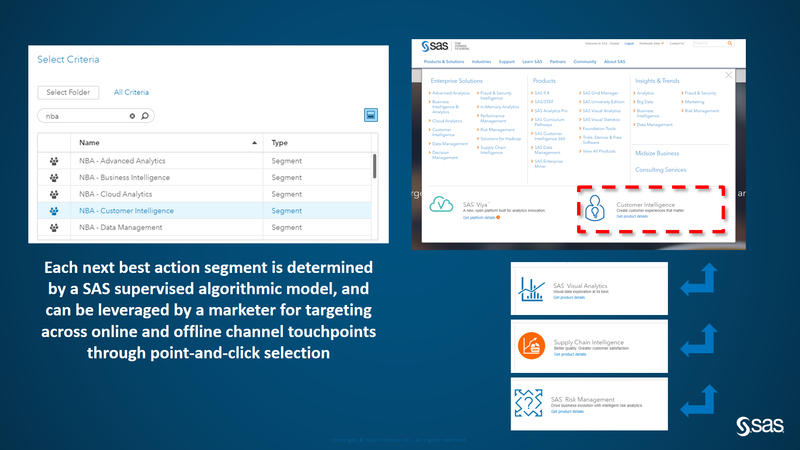 Moving on, the model’s output allows an analyst to create a table that can be used by SAS Customer Intelligence 360 to take action in future interactions across channels. 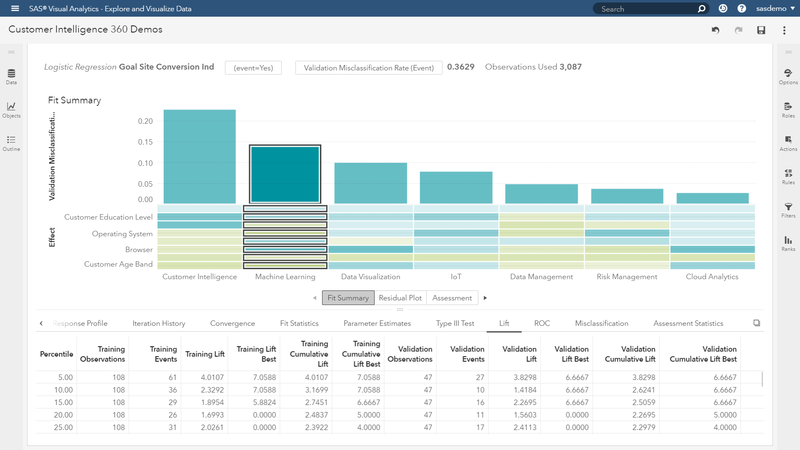 Rest assured, there are different approaches in making analytically scored data available within (and outside) of the SAS platform beyond a table. What options do analysts have in helping their marketing teams? Scoring identifiable and anonymous traffic. The ability to score in batch or real-time. 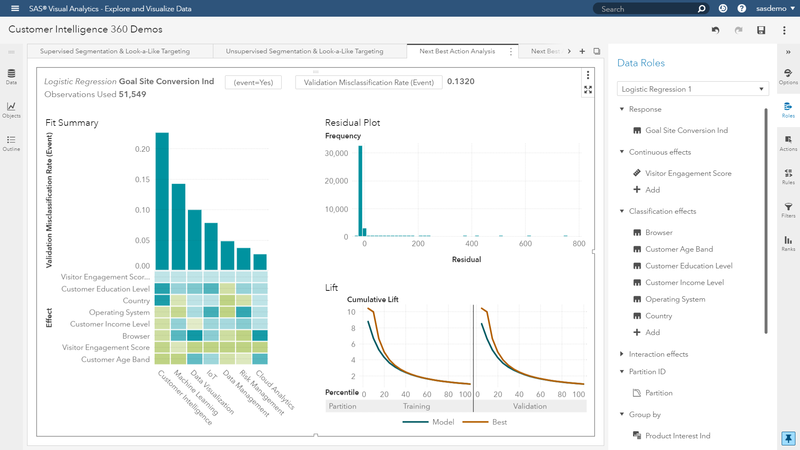 Access to the model scoring engine (SAS, Python or REST) for APIs through SAS analytic services. Now, the marketer is ready to act. The strategy will lead to a decision concerning the best offer to deliver within the touchpoint. The decision is made in real time for inbound interactions, and triggered for outbound communications. The decision will select only one (the best) proposition out of the possible offers, depending on the individual’s propensity to buy any of the seven products, their eligibility to do so, and other criteria deemed relevant. Once the assets, creatives, or messages are associated with the next best action task, and targeting rules are set, marketers can preview the experience before orchestrating. The benefits of the next best action paradigm are extremely valuable to any customer-focused organization. The question is, how do you want to deploy it? In closing, we welcome readers to obtain a free copy of the Forrester Wave™: Customer Analytics Solutions, Q2 2018 research report. Customer analytics solutions allow companies access to data-derived insights through remarkable technology, customizable to the needs of the business. 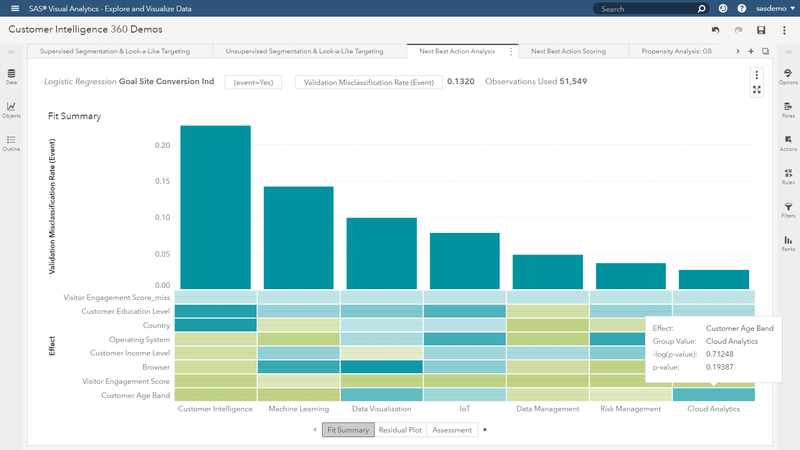 SAS Customer Intelligence maximizes automation by embedding advanced analytics, such as machine learning, across the platform allowing users to identify, acquire, track, serve and retain customers, even when they’re on multiple devices. To step ahead of competitors, brands must analyze customer data with speed, proficiency and accuracy. Micro-moments won’t wait for anyone. Suneel, thanks for posting this. I was looking for more information around Predictive NBA so I'm glad I stumbled upon this. Your micro-moment marketing link off to the Google was also super useful, lots of great Google Marketing posts.